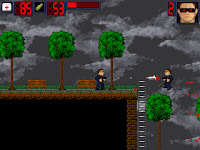 Action Cyborg is a short action game by John Karlgren with four playable levels, though it's quite unlikely that more will be added in the near future since the original artist has left the project. Speech can be turned off by using the options menu. Press the Z key to jump, or hold the X key to shoot. Switch weapons with the 1, 2, 3 and 4 keys. No continues, but there's a cheat for level skip in the text manual if you're having difficulty with the game.